Mike Beltran is doing some great work with some incredible people. 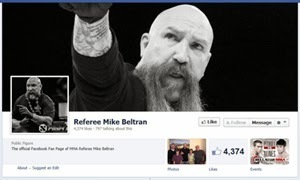 Mike is a licensed Professional Mixed Martial Arts Referee and Judge, listed as one of the Top 10 Referees in MMA. Even his moustache is famous! "Like" his official fan page to learn more. with TRIVIA in the subject line for your chance to win. The first correct entry to reach our inbox wins a HOTTDADDY® #1 Travel Kit ($100 Value), FREE! Another HOTTDADDY® Trivia contest is scheduled for 5pm CST tomorrow, Friday November 22, 2013! Visit the official HOTTDADDY® blog right here at http://hottdaddy.blogspot.com/ for details! NO PURCHASE NECESSARY to play and win! The new version of the site is launched! We're stocking inventory and preparing for the holidays. 'Out of Stock' items will be added shortly. Supplies are limited! Shop now at HOTTDADDY.com for a head start on the holidays! PayPal & all major credit cards accepted. UPDATE: 9PM CST Another HOTTDADDY® #1 Travel Kit is added for an extra chance to win! Contest ends at 11:59PM CST tonight! It's almost time! Be here at 5PM CST for details! Check here Friday, November 15th at 5PM CST for a chance to win free HOTTDADDY® merchandise. More details to follow!